Why the Healdsburg Fluoridation Moratorium Initiative? Most water districts which fluoridate do so with fluorosilicic acid. However, the fluorosilicic acid preparations used are not just fluorosilicic acid. They are a mixture of at least a dozen elements and compounds, and Dr. Sauerheber and I are going to tell you how much of each. The [NSF International, formerly the] National Sanitation Foundation is the only organization which certifies the safety of fluoridation chemicals. NSF sets the quality standards for so-called fluorosilicic acid, the most widely used type of fluoridation chemical, and the one which King, Snohomish, and Pierce Counties in Washington add to their drinking water. The NSF is a trade group which functions as a de facto FDA, falsely certifying fluoridation materials to be safe. The giant chemical and fertilizer companies which produce fluoridation materials are eligible to sit on the Board of NSF. See: www.Fluoride-Class-Action.com/sham. Note however, that NSF does not certify fluoridation materials to be effective, only to be safe. Fluoridation is illegal. See: www.Fluoride-Class-Action.com/illegal. See the most recent legal analysis of the illegality of fluoridation. See: http://jamesrobertdeal.org/motion-for-reconsideration-to-inslee. This so-called fluorosilicic acid is actually composed of many elements and compounds. NSF has reported that various tanker loads of so-called fluorosilicic acid have contained and therefore can be expected to contain the following partial list of ingredients: fluorosilicic acid, fluoride ion, hydrogen fluoride, lead, arsenic, mercury, cadmium, chromium, copper, thallium, selenium, and barium. NSF admitted in 2008 that some tanker loads emit beta radiation. This information comes from three publications by NSF, the first an April 24, 2000, letter from NSF to the Fluorida Department of Public Health, the second the 2008 NSF Fact Sheet on Fluoridation, and third the 2012 NSF Fact Sheet on Fluoridation, plus a typical Certificate of Analysis from Simplot, which supplies King and Snohomish counties with fluoridation materials. The various constituents of this so-called fluorosilicic acid react into different forms after dilution into water. They break down or with other elements and compounds as the pH and dilution change, from very low pH in the tanker truck to around 7.6 pH as it emerges, diluted, from the water treatment plant, to around 3 pH in the stomach (where half the fluoride ion is protonated into hydrogen fluoride), to around 7.4 pH in blood. The body copes with fluoride by sending it to the bones, where it binds with calcium. It is an insoluble precipitate that is not excreted for years of time because the alkaline pH of the bones prevents it from ionizing and separating from bone calcium. It is trapped in bone and accumulates lifetime. How concentrated are these various elements and compounds? How concentrated are they in the tanker truck which delivers the fluoridation material to the local treatment plant? How concentrated are they in the water emerging from the treatment plant? How concentrated are they in the water flowing from your tap, a relevant question in the case of lead, since there is much more lead flowing from the tap than in the water out in the street. The materials in the tanker truck are diluted down around 230,000 times to produce water containing fluoride ion at the so-called “optimal” level of 1.0 ppm. Snohomish and King County water is snow melt water and so is low in naturally occurring solids, although some water arrives in the storage lakes through springs and so would have travelled through mineral deposits. The source water might contain certain amounts of some of these contaminants, although Snohomish County water from Spada Lake and Lake Chaplain is snowmelt water and as pristine as found anywhere. The calculations here do not include contaminants which are found in the source water and do not include the amounts which might be added through leaching of residential pipes, but only the contaminants contributed by the fluoridation materials, unless otherwise indicated. Levels are as follows, based on fluoridation at 1 ppm fluoride. This chart will need to be revised to show levels at the new .7 ppm level. Convert the levels below by multiplying them by .7. See explanation below as to how these numbers were calculated. Sodium Carbonate: Sodium carbonate, aka soda ash, is added at the treatment plant to counter the acidity of fluorosilicic acid and chlorine. It is at around 17 ppm in water leaving the treatment plant. Sodium hydroxide (Draino) is used in other districts, with similar results. Hydrogen Fluoride: Around 1.5% of the contents of the tanker truck is hydrogen fluoride or hydrofluoric acid. In tap water at 7.6 pH HF drops to around 0.02 ppm or 602 billion atoms of hydrogen fluoride per liter of tap water. In tap water at pH 3 in the stomach the HF level is back up to .5 ppm or 15.05 million billion atoms of hydrogen fluoride per liter of stomach fluid. Silicic Acid, Specifically Orthosilicic Acid: There is little silicic acid in the tanker truck, but 0.6 ppm silicic acid in the water coming from the treatment plant, all of this contributed by the fluoridation materials, which is around 3.763 trillion molecules of osilicic acid in a liter of water fluoridated at 1.0 ppm fluoride ion. It is also referred to as silicon tetrahydroxide or Si(OH)4, a name which would imply that the chemical is not an acid, It is a slow acting and weak acid but is very persistent at dissolving lead. Selenium: There is up to 3.2 ppb after dilution at the water plant, this amount being contributed by the fluoridation materials, around 24.38 thousand trillion atoms of selenium in a liter of water fluoridated at 1.0 ppm fluoride ion. Copper: There is up to 2.6 ppb copper in water after dilution at the water plant, this amount contributed by the fluoridation materials, 24.68 thousand trillion atoms of copper in a liter of water fluoridated at 1.0 ppm fluoride ion. Lead: There is up to 1.1 ppb in water after dilution at the water plant, this being the amount contributed by the fluoridation materials, 4.647 trillion atoms of lead in a liter of water fluoridated at 1.0 ppm fluoride ion. Because silicic acid leaches lead from pipes, solder, and faucets, the lead level is up to 63 ppb at random taps measured in Everett, and up to 1,600 ppb in Seattle school drinking fountains. Arsenic: There is up to 1.6 ppb arsenic after dilution at the water plant, this being the amount contributed by the fluoridation materials, 12.8 trillion atoms of arsenic per liter of tap water fluoridated at 1.0 ppm floride ion. Beryllium: There is up to .6 ppb berillium in water leaving the water after dilution, this being the amount contributed by the fluoridation materials, 39.72 trillion atoms of beryllium per liter of tap water fluoridated at 1.0 ppm fluoride ion. Chromium: There is up to .2 ppb chromium in water leaving the water plant after dilution, this being the amount contributed by the fluoridation materials, 2.288 trillion atoms of chromium per liter of tap water fluoridated at 1.0 ppm fluoride ion. Thallium: There is up to 0.06 ppb thallium in water leaving the water plant after dilution, this being the amount contributed by the fluoridation materials, 174.6 billion atoms of thallium per liter of tap water fluoridated at 1.0 ppm fluoride ion, a radionuclide which emits beta radiation. Mercury: There is up to 0.04 ppb in tap water leaving the water plant after dilution, this being teh amount contributed by the fluoridation materials, 114.4 billion atoms of mercury per liter of tap water fluoridated at 1.0 ppm fluoride ion. Background information for non-scientists: Although the concentration of these contaminants might appear small when expressed as a percentage or as parts per million or billion, the absolute number of atoms of these contaminants in a liter of water is enormous. An atom is exceedingly small, and the number of atoms in even a small amount of a substance is mind bogglingly large. Avogadro’s Number is the number of atoms or molecules in one mole of an element or compound. A mole of an element or compound is the gram molecular weight or mass of the element or compound. The molecular weight of water, for example is 18, so a mole of water is 18 grams of water. In 18 grams of water there are 6.02 x 1023 molecules of water. In plain language that is 6.02 with the decimal point moved 23 places to the right or 602 billion trillion molecules. The number of atoms of water in a liter of water would be 3,344 billion trillion, the number of molecules of water 3.344 trillion trillion. Let’s do the same calculation for fluoride ion, assuming a concentration in tap water after dilution of 1.0 ppm. The atomic mass of fluoride ion is 19, and therefore the gram molecular weight of fluoride ion is 19. 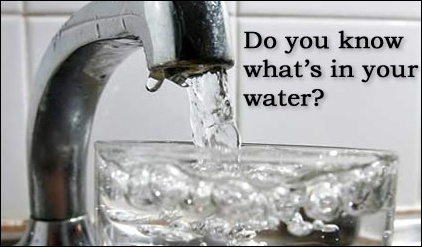 There is not 1 gram of fluoride ion in fluoridated water, but 1 milligram, which is .001 gram. To get the number of moles of fluoride ion in a liter of water divide .001 by 19, which means there is .000053 moles of fluoride ion in a liter of water, which is 5.3 x 10-5 (because we moved the decimal point 5 places to the right) moles of fluoride ion in a liter of fluoridated water. Multiply 5.3 x 10-5 x 6 x 1023 = 31.8 x 1018. That is 31.8 billion billion atoms of fluoride ion in a liter of water containing fluoride ion at 1 ppm. Although 1 part fluoride ion in one million is argued to be safe for human consumption, understand that one liter of water fluoridated with 1.0 ppm fluoride ion contains around 31.8 billion billion atoms of fluoride ion, capable of being involved in most enzymatic reactions, and consumed in greatly varying quantities for life by people of all different health conditions. The kidneys of a healthy adult eliminate around half of all ingested fluoride, but are unable to excrete the other half. It remains in the body, bound to bone permanently for the life of the consumer. Calcium fluoride is locked inside the extracellular matrix of bone, which retains a basic pH of 7.4, and at that pH, the fluoride cannot dissociate or ionize to separate from the calcium. However, fluoride in tendons or other soft tissues can gradually reduce if fluoride consumption stops. 1 ppm fluoride ion in water causes blood fluoride levels of 0.21 ppm, which in turn produces a fluoride saliva level of around .02 ppm fluoride ion (NRC Report pages 70-73). A blood fluoride level of .21 ppm is enough to inhibits the activity of DNA repair enzymes including glutamine synthase about 50%. Regarding orthosilicic acid, there is little orthosilicic acid (H4SiO4) in the tanker truck. However, when fluorosilicic acid (SiF62−) is diluted 230,000 times to the point where the concentration of fluoride ion has been reduced from 23% down to 1.0 ppm, fluorosilicic acid dissociates, and one of its breakdown products is orthosilicic acid, also referred to as silicic acid. So-called fluorosilicic acid is not just fluorosilicic acid. It contains or breaks down into water, hydrogen fluoride, fluoride ion, silicic acid, and a host of other elements in small concentrations. Orthosilicic acid (H4SiO4) is also referred to as silicon tetrahydroxide (Si(OH)4), but this name would imply that this molecule is not an acid. The name orthosilicic acid (H4SiO4) is correct because although orthosilicic acid is a very weak acid, it is capable of reacting with lead salts, even when the pH of water is alkaline as are most U.S. drinking waters. When a chemical is written starting with the “H”, the implication is that it is an acid. In water where fluoride ion is diluted to the point where there is 1.0 ppm fluoride ion, the concentration of orthosilicic acid is approximately 0.6 ppm. Orthosilicic acid has an atomic weight of 96. Therefore divide .6 x 10-9 by 96 = which yields .00625 x 10-9, which is 6.25 x 10-12 moles of orthosilicic acid in a liter of water. Multiply 6.25 x 10-12 by Avagadro’s number, 6.02 x 1023 = 37.6 x 1011 or 3.76 x 1012. That is 3.763 trillion molecules of orthosilicic acid in a liter of water fluoridated at 1.0 ppm fluoride ion. Additional harm is caused by the lead contamination present in virtually all batches of industrial fluorosilicic acid. This lead contaminant adds to the lead which orthosilicic acid leaches from plumbing. Fluorosilicic acid adds up to 1.1 ppb lead, which is significant at nearly 10% of the EPA MCL for lead in water, but it is a small amount when compared to the lead which orthosilicic acid leaches from pipes, solder, and fittings. Lead has been measured at random taps in Everett at up to 63 ppb and in Seattle school drinking fountains at up to 1,600 ppb. This is a shocking number and is 1.6 ppm, 1,067 times higher than the EPA allowed limit for lead in drinking water. When lead is present in water at 1.1 ppb, there are as many as 3.19 x 1012 atoms of lead per liter, which is 3.19 trillion atoms of lead. These 3.19 trillion atoms of lead penetrate every part of the body, are hard for the body to excrete, are highly toxic by binding to side groups on enzymes, and can do irreversible damage. A “small” amount of lead is not a small number of atoms of lead, and is wrongheaded to dismiss as insignificant. Comment from Dr. Sauerheber: Note that 0.6 ppm orthosilicic acid is 6.25 x 10-6 molar and would react one-to-one with lead bicarbonate to form 6.25 x 10-6 moles of lead ion which just happens to equal 1,300 ppb, which in turn is comparable to the 1,600 ppb lead level detected in Seattle school drinking fountains. Deal’s translation for non-scientists: How does Dr. Sauerheber convert so easily from ppm to moles? Why do we convert from ppm to moles anyway? Scientists do not like working in ppm because ppm only tells them concentration of the element or compound by weight, not the concentration by number of atoms, which they need to know to make chemical calculations. Each molecule of orthosilicic acid will dissolve one lead ion. X number of silicic acid molecules will dissolve the same X number of atoms of lead ion, but X number of lead ions will weigh more than the X number of molecules of orthosilicic acid. To convert X number of lead atoms back to ppm, multiply the moles by gram molecular weight of lead, which is 207, and you will come back out at the ppm for lead dissolved by orthosilicic acid. The calculation goes like this: 0.6 ppm orthosilicic acid per liter of water = .6 mg, which equals 0.0006 g/L or 6.0 x 10-4g/L (gram molecular weight is in terms of grams, not milligrams so we move the decimal point three places to the left). Divide 6.0 x 10-4 /L by the gram molecular weight of orthosilicic acid, 96 = 6.25 x 10-6 moles/L. (You can then multiply this number by Avagadro’s number to get the actual number of atoms, but then you will have to divide by the same number to get back to the molarity of the lead produced, so you can just skip multiplying and dividing by Avagadro’s number.) The result is that the 6.5 x 10-6 molarity of the orthosilicic acid equals the 6.5 x 10-6 molar dissolved lead ion. Next, how do we convert 6.5 x 10-6 moles of lead ion into ppm lead ion? Multiply 6.5 x 10-6 by the atomic weight, 207 g/mole, which gives 1,345 x 10-6, which is 1.345 x 10-3, which is 0.001345 g/L, which is 1.3 mg/L or 1.3 ppm or 1,300 ppb, which is close to the 1,600 ppb concentration of the lead found in Seattle school drinking fountains. The lead concentration can rise so high because orthosilicic acid because it has all weekend to do its work. I am going into all this detail to demonstrate that the science is not that complex and that we should not be intimidated by the numbers and the chemistry. The science is easy enough, and the case against fluoridation is so overwhelming, that you do not need a Ph.D. in chemistry to understand that it is potent and harmful. It is a mistake to presume that we as non-scientists cannot understand these scientific concepts and must rely unquestioningly on men in white coats. The NSF standard 60 requires that a score of toxicological studies be done on fluoridation materials, however, NSF has admitted that it is not enforcing this requirement. Laws in some 47 states such as WAC 246-290-220 state that fluoridation may be done only with fluoridation materials which “comply” with NSF Rule 60. Because the toxicological studies are not being done, our fluoridation materials do not “comply” with NSF Rule 60. Fluoridation with fluorosilicic acid is therefore illegal. There are other reasons why fluoridation is illegal. Our city councils and water districts ignore this conspicuous violation of law at the peril of themselves someday being personally liable in court. Some deadly compounds break down into harmless elements or compounds. Cyanide, for example, a deadly poison, carbon triple bonded to nitrogen, breaks down into harmless carbon and nitrogen when the substance is burned. However, the elements listed above do not break down. Elements are indestructible. They can continue their destructive anti-enzymatic activity all your life. Arsenic: NSF acknowledges that shipments of fluoridation materials have been found to yield up to 1.6 ppb arsenic after dilution down to the level where fluoride ion is at 1 ppm. Arsenic has a molecular weight of 75. At the concentration of 1.6 ppb in water, the calculation of the number of atoms of arsenic in a liter of water is 1.6 x 10-9, which is .0000000016 (note that I moved the decimal point nine places to the left), which is the number of grams of arsenic in a gram of water. Divide that by the atomic number, which is 75. That yields 2.1 x 10-10 moles of arsenic x Avagadro’s number, 6.02 x 1023 = 12.8 x 1012. That is 12.8 trillion atoms of arsenic per liter of tap water fluoridated at 1.0 ppm floride ion. Regarding selenium, NSF acknowledges that shipments of fluoridation materials have been found to yield up to 3.2 ppb selenium (3.2 x 10-9) after dilution down to the level where fluoride ion is at 1 ppm. The atomic weight of selenium is 79 and a mole of selenium therefore weighs 79 grams. Divide 3.2 x 10-9 by 79 = .0405 x 10-9 or 4.05 x 10-11 moles of selenium in a liter of fluoridated water. Multiply 4.05 x 10-11 by Avadadro’s number, 6.02 x 1023 = 24.38 x 1012, which would be 24,380,000,000,000. That is 24.38 thousand trillion atoms of selenium in a liter of water fluoridated at 1.0 ppm. Regarding copper, NSF acknowledges that shipments of fluoridation materials have been found to yield up to 2.6 ppb copper (2.6 x 10-9) after dilution down to the level where fluoride ion is at 1 ppm. The atomic weight of copper is 63.54 and a mole of selenium therefore weighs 63.54 grams. Divide 2.6 x 10-9 by 63.54 = .041 x 10-9 or 4.1 x 10-11 moles of copper in a liter of fluoridated water. Multiply 4.1 x 10-11 by Avadadro’s number, 6.02 x 1023 = 24.68 x 1012, which would be 24,680,000,000,000. That is 24.68 thousand trillion atoms of selenium in a liter of water fluoridated at 1.0 ppm. Returning to lead, NSF acknowledges that shipments of fluoridation materials have been found to yield up to 1.1 ppb lead (1.1 x 10-9) after dilution down to the level where fluoride ion is at 1 ppm. The atomic weight of lead is 207.2 and a mole of lead therefore weighs 207.2 grams. Divide 1.1 x 10-9 by 207.2 = 5.3 x 10-12 moles of lead in a liter of fluoridated water. Multiply 5.3 x 10-12by Avadadro’s number, 6.02 x 1023 = 31.9 x 1011 or 3.19 x 1012, which would be *3.19 trillion atoms of lead in a liter of water fluoridated at 1.0 ppm. Regarding the lead in Seattle school drinking fountains at 1,600 ppb, the concentration of atoms would be a thousand times larger than that in the treated water supply, which was 1.1 ppb, so the number of atoms in Seattle schools would have been 4,647 trillion or 4.647 thousand trillion atoms of lead in a liter of water fluoridated at 1.0 ppm fluoride ion. Regarding beryllium, NSF acknowledges that shipments of fluoridation materials have been found to infuse up to 0.6 ppb beryllium after fluoridation materials have been diluted down to the level where fluoride ion is at 1 ppm. Beryllium has a molecular weight of 9. At the concentration of 0.6 ppb in water, the calculation of the number of atoms of beryllium in a liter of water is as follows: Start with 0.6 ppb or 0.0000000006 or 0.6 x 10-9. This is the grams of beryllium in a gram of water. Divide that by the atomic number, which is 9. Then 0.6 x 10-9 divided by 9 = 0.066 x 10-9 or 6.6 x 10-11, the moles of beryllium in a liter of water. Multiply x 6.6 x 10-11 x Avagadro’s number, 6.02 x 1023 = 39.72 x 1012 or 3.972 x 1013. That is 39.72 trillion atoms of beryllium per liter of tap water fluoridated at 1.0 ppm fluoride ion. Regarding barium, NSF acknowledges that shipments of fluoridation materials have been found to add up to 0.3 ppb beryllium to water after fluoridation materials have been diluted down to the level where fluoride ion is at 1 ppm. Barium has a molecular weight of 137. At the concentration of 0.3 ppb in water, the calculation of the number of atoms of barium in a liter of water is as follows: Start with 0.3 ppb or 0.0000000003 or 0.3 x 10-9. This is the grams of beryllium in a gram of water. Divide that by the atomic number, which is 137: .3 x 10-9 divided by 137 = 0.0022 x 10-9 or 2.2 x 10-12, the moles of barium in a liter of water. Multiply 2.2 x 10-12 x Avagadro’s number, 6.02 x 1023 = 13.24 x 1011 or 1.324 x 1012 or 1,324,000,000,000. That is 1.325 trillion atoms of boron per liter of tap water fluoridated at 1.0 ppm fluoride ion. Regarding chromium, NSF acknowledges that shipments of fluoridation materials have been found to add up to 0.2 ppb chromium to water after fluoridation materials have been diluted down to the level where fluoride ion is at 1 ppm. Chromium has a molecular weight of 52. At a concentration of 0.2 ppb in water, the calculation of the number of atoms of chromium in a liter of water is as follows: Start with 0.2 ppb or 0.0000000002 or .2 x 10-9, which is grams of chromium in a gram of water. Divide that by the atomic number, which is 52: .2 x 10-9 divided by 52 = 0.0038 x 10-9 or 3.8 x 10-12, the moles of chromium in a liter of water. Multiply 3.8 x 10-12 x Avagadro’s number, 6.02 x 1023 = 22.88 x 1011 or 2.288 x 1012 or 2,288,000,000,000. That is 2.288 trillion atoms of chromium per liter of tap water. Regarding cadmium, NSF acknowledges that shipments of fluoridation materials have been found to add up to 0.12 ppb cadmium to water after fluoridation materials have been diluted down to the level where fluoride ion is at 1 ppm. Cadmium has a molecular weight of 112. At the concentration of 0.12 ppb in water, the calculation of the number of atoms of cadmium in a liter of water is as follows: Start with 0.12 ppb or 0.00000000012 or 0.12 x 10-9 grams of cadmium in a gram of fluoridated water. Divide that by the atomic number of cadmium, which is 112: 0.12 x 10-9 divided by 112 = 0.00107 x 10-9 or 1.07 x 10-12, which is the moles of cadmium in a liter of water. Multiply 1.07 x 10-12 x Avagadro’s number, 6.02 x 1023 = 6.44 x 1012 or 6,440,000,000,000. That is 6.44 trillion atoms of cadmium per liter of tap water fluoridated at 1.0 ppm. Regarding mercury, NSF acknowledges that shipments of fluoridation materials have been found to add up to 0.04 ppb mercury to water after fluoridation materials have been diluted down to the level where fluoride ion is at 1 ppm. Mercury has a molecular weight of 201. At the concentration of 0.04 ppb in water, the calculation of the number of atoms of mercury in a liter of water is as follows: Start with 0.04 ppb or 0.00000000004 or 0.04 x 10-9 grams of mercury in a gram of fluoridated water. Divide that by the atomic number of mercury, which is 201: 0.04 x 10-9 divided by 201 = 0.000199 x 10-9 or 1.9 x 10-13, which is the moles of mercury in a liter of water. Multiply 1.9 x 10-13 x Avagadro’s number, 6.02 x 1023 = 11.44 x 1010 or 114,400,000,000. That is 114.4 billion atoms of mercury per liter of tap water fluoridated at 1.0 ppm. Regarding hydrogen fluoride, Simplot’s Certificate of Analysis shows that around 1.5% of the contents of a tanker truck load of so-called fluorosilicic acid is hydrogen fluoride. NSF acknowledges on its Fact sheet that after dilution of fluoridation materials down to the level where fluoride ion is at 1 ppm, hydrogen fluoride is present at .02 ppm, which is in treated water at pH 7.6. In the stomach at pH 2-4, the hydrogen fluoride concentration is up to 0.5-1 ppm, whereas fluoride ion has correspondingly dropped. Notice how fluoride ion and hydrogen fluoride convert from one to the other depending on the dilution and the pH. Hydrogen fluoride has a molecular weight of 20. At a concentration of 0.02 ppb in water coming from the treatment plant at pH 7.6, the calculation of the number of molecules of hydrogen fluoride in a liter of water is as follows: Start with 0.02 ppb or 0.00000000002 or 0.02 x 10-9 grams of hydrogen fluoride in a gram of fluoridated water. Divide that by the atomic weight of hydrogen fluoride, which is 20: 0.02 x 10-9 divided by 20 = 0.001 x 10-9 or 1.0 x 10-12, which is the moles of hydrogen in a liter of water at pH 7.6. Multiply 1.0 x 10-12 x Avagadro’s number, 6.02 x 1023 = 6.02 x 1011 or 602,000,000,000. That is 602 billion molecules of hydrogen fluoride per liter of tap water at pH 7.6. However, in the stomach it is a different story, because at pH 2-3, most of the fluoride ion is protonated into hydrogen fluoride, so hydrogen fluoride is present in the stomach at around 0.5-1 ppm. So let’s run the numbers again for 0.5 ppm. Again, hydrogen fluoride has a molecular weight of 20. At a concentration of 0.5 ppm in the stomach, the calculation of the number of molecules of hydrogen fluoride in a liter of stomach fluid is as follows: Start with 0.5 ppm or 0.0000005 or 5.0 x 10-7 grams of hydrogen fluoride in a gram of fluoridated water. Divide that by the molar weight of hydrogen fluoride, which is 20: 5.0 x 10-7 divided by 20 = 0.25 x 10-7 g/ml or 2.5 x 10-8 or 0.000025 moles of hydrogen fluoride in a liter of stomach fluid at pH 3.0. Multiply 2.5 x 10-8 x Avagadro’s number, 6.02 x 1023 = 15.05 x 1015 or 15,050,000,000,000,000. That is 15.05 million billion molecules of hydrogen fluoride per liter of stomach fluid at pH 3.0. Finally, there is thallium. NSF acknowledges that shipments of fluoridation materials have been found to add up to 0.06 ppb thallium to water after fluoridation materials have been diluted down to the level where fluoride ion is at 1 ppm. Thallium has a molecular weight of 204. At the concentration of 0.06 ppb in water, the calculation of the number of atoms of thallium in a liter of water is as follows: Start with 0.06 ppb or 0.00000000006 or 0.06 x 10-9 grams of thallium in a gram or ml of fluoridated water. Divide that by the atomic number of thallium, which is 204:0.06 x 10-9divided by 204 = 0.00029 x 10-9 or 2.9 x 10-13, which is the moles of thallium in a liter of water. Multiply 2.9 x 10-13 x Avagadro’s number, 6.02 x 1023 = 17.46 x 1010 or 174,600,000,000. That is 174.6 billion atoms of thallium per liter of tap water fluoridated at 1.0 ppm fluoride ion. “In a classic beta decay a neutron [gives off an electron and becomes positive and] turns into a proton, and a beta particle (electron) and an anti-neutrino are ejected from the nucleus”. This amount of radiation approaching you from outside your body would not even penetrate your skin. However, once a thallium atom becomes part of the body, it is inside cells and only Angstrom units away from DNA molecules. There is no safe level of ingested radioactivity. The only defense which the fluoridationists have when we tell them that their fluoridation materials contain fluorosilicic acid, fluoride ion, hydrogen fluoride, lead, arsenic, mercury, cadmium, chromium, copper, thallium, selenium, and barium is to counter that the amounts are small. To the contrary, the amounts are not small. The amounts of fluoride ion, hydrogen fluoride, and orthosilicic acid, are large even as a percentage of all the additives. Further, the amount of lead which orthosilicic acid dissolves out of pipes can be enormous, as high as 1,600 ppb. It is amazing that we ignore the fluorosilicic acid connection with lead leaching. In addition, fluoridationists ignore the possibility that all these toxic substances are more potent as a mixture than they are individually. Read the original article showing the latest updates from Dr. Sauerheber in green.